Are you a woman of color in need of a breakthrough? If you've experienced self-doubt or a lack of focus due to questioning your skills or competence (in your relationships, your career, your business), this experience is for you! Our Level Up! Transformation will be available for pre-registration soon. Receive active coaching from Dr. T and peer coaching/#squadcare from your fellow participants. The group will be held in a comfortable environment for learning and engaging. The registration fee covers coaching, handouts, and refreshments. 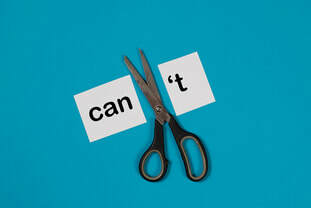 Teal background with pair of scissors cutting the "apostrophe-T" off the word "can't"
​* Check out our new "I Can't" podcast on the Anchor app and other podcast formats. Personal life skills training to support your overall wellness. Personal and group coaching to activate growth and movement in your relationship, career or business. A variety of customized awareness building opportunities available related to inclusion, relationships, education and other topics of choice. Educational consulting to support the implementation of effective and equitable educational practices. Today is YOUR new day. " 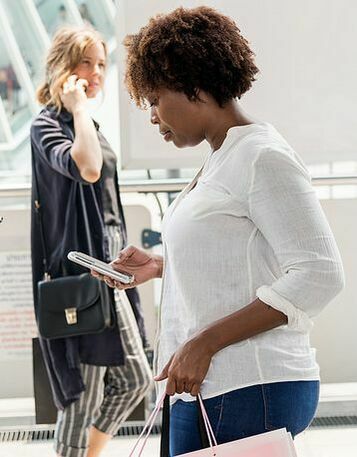 One woman in background walking and holding a cell phone to her ear. Another woman in foreground tapping on her cell phone screen while holding a shopping bag. training for your employee group /organization. ​We are ready to work for you! ​Contact Form on the "Let's Connect" page.